Second, all hard drives are at risk of failure at any point in time and a hard drive failure can be catastrophic. If you run your own business and keep your accounts on the computer, or you have photos of your baby which are simply irreplaceable. I have seen many people reduced to tears from the result of a hard drive failure. The fact is that a bad situation like this can be so easily avoided with a simple external portable hard drive. 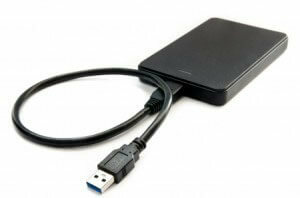 Large external hard drives are very affordable and could save you from a horrible experience. I have listed a few examples of the best selling external portable hard drives available from Amazon UK. Sizes and prices vary but I would always get the bigger drive myself. Dependent on manufacturer, the drive may come with software to help make the back up process easy. If software is not provided, backing up your documents and photos is a simple drag and drop task that most users should achieve easily. If you wish to back up your entire hard drive, I would recommend software such as Acronis True Image Plus 2016 which allows you to create an image of your drive and everything on it. This image can be used to restore your PC (Including Windows and all software) to a new hard drive should your old drive fail. A small price to pay for security and peace of mind. Acronis 2016 also works on Apple Mac computers.